I started working in Eastern Group Publications in the middle of the 1990’s, the decade when voters in California wanted to deny immigrants a public education, health care, and to allow authorities to stop and question anyone they suspected of being in the country illegally. Yes, it was the time of Pete Wilson’s governorship, Prop. 187 – to eliminate social services for immigrants – and Prop. 227 to make California an English Only state. It was a time of upheaval and change, some of it good, some of it – not. It was the decade when some of the cities in Southeast Los Angeles County with majority Latino populations saw major changes in their leadership. 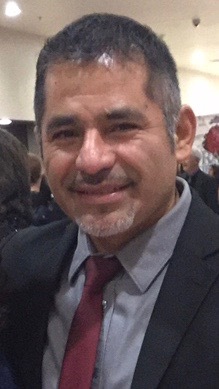 Latinos swept into office in Bell Gardens, Cudahy, Bell, South Gate and Maywood. It was all happening as South Los Angeles, Inglewood and Compton started a demographic transformation as more Latinos moved in. Because of the continued growth of the Latino community in Los Angeles, mainly from Mexico and Central America, the need for information in Spanish in this region was fundamental, so Eastern Group Publications Inc. (EGP) became the only bilingual publication in many of those areas. 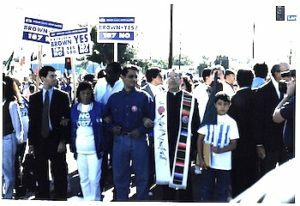 Even though the newspaper’s circulation was mainly in East Los Angeles, EGP always published information that affected the Latino community as a whole and it wasn’t rare to cover events in South/Southeast Los Angeles, West Los Angeles and of course East L.A.
At the beginning of 1990, 85% of the population in Southeast L.A. was Latino, but still most of their political representatives were white, in part because of people’s apathy to getting involved in politics and because only 45% of the population was registered to vote. In 1991, Bell Gardens, a city located nine miles south of downtown Los Angeles, where more than 90% of the population was Latino, a recall effort led by one woman, Maria Chacon, to oust four white city councilmembers and replace them with leaders that reflected the population succeeded. For the people of Bell Gardens there was great hope that things would be different. Chacon and other leaders with political ambitions in the city worked the political system and for the next decade were involved in political battles to maintain power. Sadly, while some things got better, the improvements came with charges and convictions for corruption. This situation wasn’t unique to Bell Gardens. In 1994, other surrounding cities like Cudahy, Bell and Maywood went down similar roads, and EGP was there to report it. Working at EGP gave me and the newspapers’ other reporters an immediate connection to the people in the area. Many times we were the first media outlet to carry stories from those cities and neighborhoods, which would later be published in the mainstream media. In response to the growing number of Spanish speaking immigrants in California, new laws against undocumented people began to emerge in Sacramento. Proposition 187, known as Save Our State (SOS), was approved by California voters in 1994, prohibiting access to education, healthcare and welfare benefits by undocumented families. Even though it never took effect, the courts ruled it unconstitutional, it still had an enormous impact on Latino families, particularly immigrants. I recall writing stories about people not wanting to go to the supermarket because they feared being stopped and asked to prove their citizenship. Parents would not take sick children to the doctor because they feared the information they shared would sooner or later lead to deportation. More than twenty years have passed, and those fears are as real today. On the flip side, we offered extensive coverage on the growing activism in the Latino community, among citizens and the undocumented, to support and protect the most affected and vulnerable groups, including the more than 1.3 million undocumented immigrants living in the state. They were always fighting inequality, fighting for better salaries, lower rent, and the right to educate their children in the language of their choice, whether it was English only or in a bilingual program. There were so many issues affecting people’s quality of life. After the 1992 riots, many people decided to leave the area, creating an opportunity for a new group coming from south of the border to move into what were once predominately African American neighborhoods. Gang violence flared up and devolved into racial war zones between African Americans and the Latinos moving into their neighborhoods in search of cheaper housing, as well as in other parts of the city where Latinos were the majority. EGP’s editorial staff was small. We didn’t have the resources of many large newsrooms, still we managed to report on so many issues and the many good things taking place in the communities we served. We got the stories because we were dedicated, ambitious and connected to the community; they would call to let us know what was going on in the neighborhood, the good and the bad. They wanted to be heard, and trusted us to listen and to tell their stories accurately. An important aspect of EGP that I want to highlight is that in the seven years I worked for the paper, neither my editors or the owners of the company ever censured my stories; even the ones that weren’t too popular with the system or an advertiser. The freedom to write or pick a topic to report on was what I most value about EGP. That’s why, when I heard a few months ago that the Sanchez family was going to sell, I felt sad. I knew that without the Sanchez family it would be hard to continue reporting to the community with that same level of commitment, especially now, in Trump’s era. As a reporter and member of the community, I just want to thank the Sanchez family for being there for the people for the past four decades. But also, because during my time working for the paper, I always felt part of the family, even now, as the years have flown by. Every time we have a chance to talk, it’s as if no time has passed. 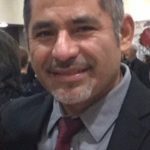 I want to thank Publisher Dolores Sanchez, and her late husband, COO Jonathan Sanchez, for giving me the opportunity to begin and develop my career as a journalist in Los Angeles. I will never forget that through EGP, I was given the opportunity to serve the community for a better future.